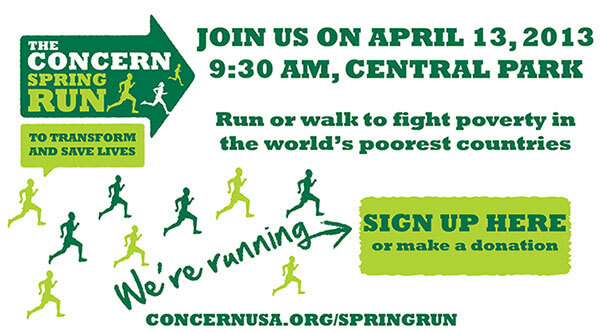 The 15th Annual Concern Spring Run takes place on Saturday, April 13, 2013. Hundreds of runners and walkers will tackle the 4 mile course in Central Park. You can help change the lives of the world’s poorest by participating, and raising as much support as you can. This event is a wonderful example of the community coming together to help Concern Worldwide US raise awareness about extreme poverty in some of the poorest and most vulnerable communities in our world. Plus it’s an unforgettable morning of pure fun –and all for a good cause.